Yesterday in the NY Times there was an article about scientists in Tel Aviv who invented “beautification” software. 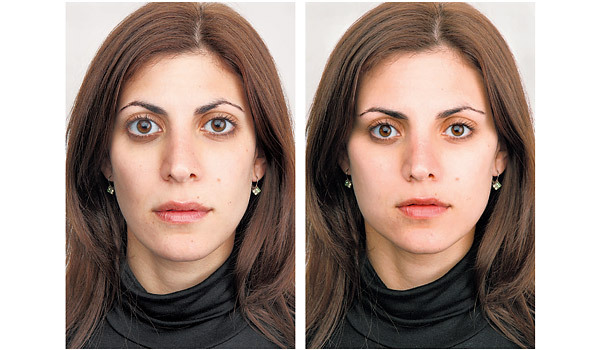 Based on the idea that humans around the world praise facial beauty by the standards of symmetry , youthfulness; clarity or smoothness of skin; and vivid color in the eyes and hair, they can take someone’s picture and make them more “beautiful”, like the image above. The problem with this standard is that it really doesn’t allow for individuality, and to me that is what truly makes someone beautiful. I find Uma Thurman to be gorgeous at one turn and a bit funny looking the next. Also, not to be cliche, but someone’s spirit makes them beautiful and inevitably attract, or repelling. I have dated gorgeous men who’s hotness became such a non-factor because they were jerks, and plain men who became so much more attractive because they were kind. I interview the brilliant Simon Doonan this past summer about his book “Eccentric Glamour” where he laments that everyone wants to have cookie cutter beauty, like women from The Hills: pretty, but forgettable in their sameness. Instead he champions women like Tilda Swinton and the Olsen Twins, who while considered funny looking, are exquisite in their uniqueness. Here is a link to the interview, which was both hilarious and thought provoking, enjoy!